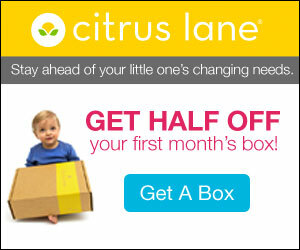 Home / Hot Deals / *Hot Deal* Citrus Lane Box + Free Shipping! *Hot Deal* Citrus Lane Box + Free Shipping! Have you heard about Citrus Lane? Monthly Subscription boxes are becoming very popular. Citrus Lane is delivered to your door with only Mommy recommended products. All products are hand picked for your child’s age. Use code: TAKEHALF at checkout + Free Shipping! We’re having a special offer associated with the Epic Battle of Cute. By using coupon code “CUTEOFF” new subscribers will receive a free box with the purchase of a 3-, 6-, or 12-month subscription. Click GET A BOX Now to claim your box! Previous post: If you love cooking, check out this giveaway from Better Than Bouillon Ending 11/28!! Next post: *Starbucks* Buy 1 Get 1 Free Holiday Drink!